The meeting place for this trip is about 1.5 hours northwest of Gainesville on the Suwannee River. Cost: This one is $50 per person ($39 for “wanna go” members). With your own boat it’s $40 per person ($29 for members). On this 9 mile, downstream paddle, We go from Madison County Blue Spring State Park down to the confluence of the Withlacoochee and Suwannee Rivers. 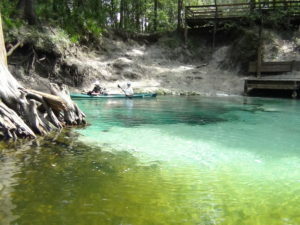 We’ll take out at Suwannee River State Park. This is usually a 4 – 4.5 hour trip (including lunch and swim stops). 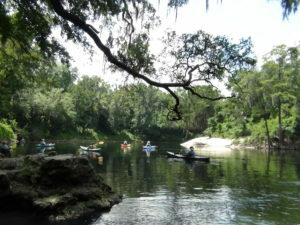 Like nearby sections of the Suwannee, this part of the Withlacoochee carves a relatively deep (by Florida standards) channel through the Florida highlands region. 30 – 40 foot bluffs are typical and some are even higher. Passing through the Cody Escarpment, the zone where the Central Highlands make their gradual descent to the Gulf Coastal Plains, the river carves it’s way ever closer to the underlying Floridan aquifer. Finally, it cuts deep enough to tap the aquifer and a spring gushes to the surface. Blue Spring is born. From this point on down, more vents in the limestone create more springs – at least half a dozen of them by the time Withlacoochee joins Suwannee. Some of these are small, easy to miss vents in the river bed, while others are nothing short of azure oases to the passing paddler. This is an easy, downstream paddle. The hot weather should be your main consideration. It’s a fairly wide channel that could be sunny and hot (of course, you can stop and swim whenever you want). The length of trip (4 – 4.5 hours) might be a bit long for some of you. The biggest concern/challenge is a couple of big shoals. In high water, you won’t even know these shoals are there. But in normal to low waters, you’ll be well-aware of them ;o). 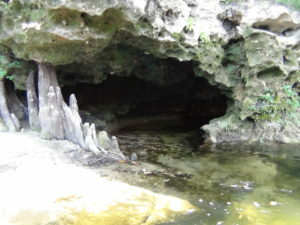 The largest is Nicks Shoal, about an hour before the river joins Suwannee. These should be approached and paddled with great caution. At Nicks Shoal there is a descent (not great) portage around the left side. If you aren’t absolutely sure of your abilities, portage!